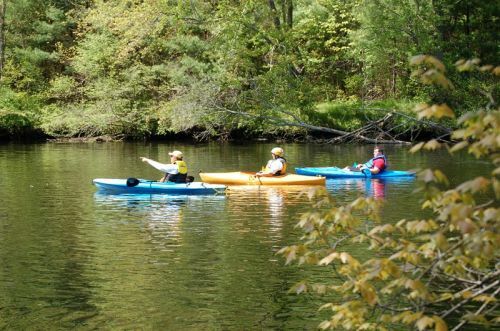 The Quinebaug River Water Trail offers 45 miles of paddling within an hour's drive of three of New England's largest urban regions. Many of the segments provide an opportunity for family-friendly, close-to-home outdoor adventures with a surprisingly remote feel; wildlife is abundant and the only traces of civilization are the remnants of old mills. Location: Northeastern Connecticut and adjacent area in Massachusetts. It begins in Holland, Massachusetts and ends in Canterbury, Connecticut. Accessible from Interstates 84 and 395, US Rt 20. See Paddlers Guide and Stewardship Plans for directions to individual segments. The Quinebaug River Water Trail flows through The Last Green Valley National Heritage Corridor and within the Quinebaug and Shetucket rivers valley known as a relatively undeveloped rural enclave in the midst of the most urbanized region in the nation. The Last Green Valley is 77% forest and farmland, and appears distinctively dark at night when viewed from satellites or aircraft. The Quinebaug and Shetucket Rivers eventually combine to become the Thames River, creating the the third largest watershed emptying into Long Island Sound. Within the corridor are several US Army Corps of Engineers flood control projects. The Corps led the way by nominating two of the following segments as NRTs before the rest of the river was nominated. Six water trail segments on the Quinebaug River provide almost 45 miles of paddling. Note that not all segments are contiguous due to impassable dams. 6. Wayne R Lafreniere Canoe Launch in Killingly, CT, to the CT DEEP Fish Hatchery in Plainfield, CT, Robert Manship Park in Canterbury, CT, and Butts Bridge in Canterbury, CT (15.5 miles). The Last Green Valley, Inc. and the US Army Corps of Engineers partner with the Willimantic River Alliance, federal and state agencies, non-profits, riverside towns, and paddlers to promote enjoyment and stewardship of the Quinebaug River. An active Water Trails Steering Committee has developed stewardship plans and paddlers guides, made launch site improvements and hosted public events to raise public awareness and increase recreational use. Other water trails that have been developed in the greater Thames River watershed include the Willimantic National River Water Trial and the Shetucket National River Water Trail. Fabyan Canoe Launch. Photo by US Army Corp of Engineers. West Thompson Lake Boat Ramp Parking Lot. Photo by US Army Corp of Engineers. View of West Thompson Lake from the dam. Photo by US Army Corp of Engineers. Quinebaug Paddling. Photo by A. Dabrowski. North View from West Thompson Lake Boat Ramp. Photo by US Army Corp of Engineers. Going Down the Quinebaug. Photo by US Army Corp of Engineers. Canoe and kayak launch. Photo by US Army Corp of Engineers.